sten ?your seat belts. ?The Gang?s All Here?is too much. It?s the thrill ride of Hollywood musicals. If you?ve not seen it but have seen other Busby Berkeley movies you?re thinking, Yeah, got it. But all the fabulous excesses of Berkeley in black-and-white pale in comparison with Berkeley + Technicolor, Berkeley unleashed. It?s not just an extraordinary musical, it?s an extraordinary movie, and there never was and never will be anything like it. It is truly one of the most visually astonishing films ever made. Often there is so much happening on the screen?and so rapidly?that it produces a sort of sensory overload that forces the viewer?s brain to edit all those visuals, selectively take in the images, and the result is a kind of signal loss.This may explain why people often come away thinking they?ve just seen something light and frothy, which it is, but it?s also intensely radical. Hence this Viewer?s Guide, which I hope will help you get the most out of your viewing experience. But before we take on this glorious cinematic experience, let?s talk about the backstage musical, a tradition that began as soon as sound and music came to the movies. The first sound feature,?The Jazz Singer, has elements of a backstage musical, and the first full-on movie musicals were either revues or backstage musicals or some hybrid of the two. Backstage musicals like?Broadway Melody, Syncopation, Glorifying the American Girl, Footlights andFools Dance of Life,?and?On With the Show? (which has elements that would recur in?42nd Street) were a sensation in 1929. Within a few months came Paul Fejos?s?Broadway,?for which the adventurous Hungarian emigr? director had designed?the first camera-crane. It?allowed him to bypass the static, proscenium-bound quality of most musicals of the era. Fejos used the crane to navigate Broadway?s incredible set, soaring from floor to the top of the soundstage and back. Gold Diggers of Broadway?(1929). Note the giant tulips?oversized props preceded Berkeley in Hollywood, but nobody ever used them more imaginatively. The King of Jazz (1930) has what we think of as Berkeleyesque spectacle. Busby Berkeley came to Hollywood after serving as dance director on more than 20 Broadway musicals in the 1920s. He brought with him a lot of devices used in stage musicals at the time: giant props, women as chandeliers, women lashed to harps? all that came straight from the Broadway spectacles of the period. The set of Paul Fejos?s Broadway, prowled by cinema?s first giant camera-crane. #1 Is this your first Busby Berkeley movie? If not, skip to #2. Okay, Berkeley virgins, congratulations on taking the plunge, and plunge it is, because this is not only not Berkeley 101, it?s more like doctoral material. You are jumping in to the deep end. But it was my first Berkeley, and I?ve been hooked ever since. Please don?t worry about the silly, bare-bones mistaken-identity plot or the two-dimensional characters. I know that?s how we just most movies?by how well they handle the narrative dimension, but if Buzz doesn?t care, why should we? As he demonstrates here, there are lots of other interesting things to put on the screen. Most famously, giant bananas. Or more properly, scantily clad babes, about 60 of them, waving 5-ft-long bananas around for several minutes, sometimes in slow motion, sometimes from overhead, where as they are raised and lowered they form as kind?of giant fruit cloaca (completed by some beachball-sized?strawberries). The giant bananas are only the beginning, though. Berkeley is messing with us, starting with the very first shot after the conventional credits. The conventional way to orient the audience is to open with a long establishing shot?if it?s a New York movie most likely boat traffic on the river with the skyline behind, or an aerial shot of the endless buildings. Berkeley takes a different tack. #2?This is your mantra: THE HELL WITH REALISM. Use it if the movie?s opening shot of a singing disembodied head floating in darkness feels unsettling. ?The Gang?s All Here?opens with one of the most remarkable tracking shots in cinema, and if you?re trying to figure out who the guy is, why his head is floating in space, and where?those diagonal lines of bamboo that appear to the left of him came from, you won?t be able to focus on the shot. The opening shot of The Gang?s All Here. Instead of an establishing shot of the city, we get a disembodied head floating in space. ? ? ?? ?? ?? The man?s head is pushed off the right side of the screen as the camera pans left over the diagonal lines of the liminal space to a pier and the prow of a ship, S.S. BRAZIL, then continues left. We see a set, a New York skyline, as well as passengers disembarking from the ship and cargo being unloaded from nets. Is this supposed to be a real ship? The camera isn?t telling. It continues to move, now following a cart full of big bags of sugar being pushed to the right of the frame, then it gets distracted by a little group of young women running to the left, waving with hankies at someone they?re greeting, and then it rises up the side of the ship to a net of cargo being lowered to the pier. All this time we hear a chorus singing the lovely popular tune ?Brazil,? the only song in the movie not composed by the great Harry Warren (who won a Best Song Oscar for ?The Lullaby of Broadway,? from Berkeley?s?Gold Diggers of 1935). A crew of men unload the cargo and send the hook back up for the next load. We see a huge net bursting with luscious Technicolor fruit of all kinds being slowly lowered from the ship?s deck to the pier. The fruit fills the frame, the camera lingers over this mouth-watering shipment, then tracks down to the bottom of it, and there?suddenly, the movie?s first close-up, the glorious Carmen Miranda, she of the fruit hats, grinning conspiratorially?we?re in on the joke.? ? ? ? ? ?? ? ?? ?? When I saw this in the ?70s at Theatre 80 St. Marks Place, one of Manhattan?s late lamented rep cinemas, some members of the audience howled with joy. We?re three and a half minutes into the movie, and Miranda is only the second face the restless camera has settled on. Unlike Disembodied Singing Guy in the opening shot, Carmen?s head is attached to her body, clad in one of Yvonne Wood?s fantastic costumes. 3) Carmen Miranda! Everyone has seen her, but if you?ve never actually seen her in a movie, be prepared: She?s a piece of work. I mean that in the best possible way. Carmen Miranda is a goddess; she is eternal. Carmen Miranda, aka ?the Brazilian Bombshell,? came to the U.S. in 1940 after being spotted by Broadway producer Lee Shubert. She had been Brazil?s biggest singing star for a decade, a massively successful recording artist and radio performer, and had even appeared in several Brazilian movies before coming north. It was not until she became the walking talking singing symbol of ?Pan-American friendship,? a massive, crucial political initiative during the Second World War, that she became the icon we know today, dressed in bizarre exotic ensembles, impossibly tall platform shoes (how on Earth did she dance in those things without breaking a leg or getting a concussion?) and outrageous hats, often decorated with fruit. Like Fats Waller and Cab Calloway, Carmen Miranda?s personality is so powerful that most people don?t notice what a great singer she is. Close your eyes for a minute and listen: She has a lovely voice. Now open them. You will be able to think of her as both camp icon and excellent singer. This will make her even more fun to watch. Another astonishing costume by Yvonne Wood. Note the gold platforms. Also, note how tiny she is. If you subtract the four inches (or more) she gains from the platform shoes, and the height of whatever hat or coif she?s sporting in any given scene, she?s got to be around five feet tall. Keep this in mind when watching her do her thing. Carmen Miranda was incandescent, a force of nature. You might not feel how vibrant she is if you?re distracted by the outrageous clothes, makeup, accent, expressions. Carmen Miranda was extremely popular in the States throughout the early ?40s, but after the war ended in 1945 her role as all-purpose Latino comedy relief became superfluous. She suffered the same fate as Mary Pickford and others who were so successful with particular performing personas that they got trapped, nobody was interested in seeing Carmen Miranda as an actual character in more realistic settings. She succeeded wildly, then couldn?t find a way to redefine herself. Meanwhile, back in Brazil, she was considered a cultural traitor, a sell-out, She only returned home a couple of times before her death from a heart attack in 1955 at the age of 46. 4) And finally, with Miranda?s close-up, we know for sure that we?re watching a show-within-the-movie. Everything has happened so quickly that we haven?t had time to register it. But just to clarify how out-there this movie is, conventional movies, as Drew Caspar points out, open with an establishing long shot?if we?re in New York it?s usually the Hudson or East River with boats and the skyline behind it, or an aerial shot of Manhattan buildings. But Berkeley doesn?t want us to know where we are or what we?re seeing. He?s messing with us. The movie has been running for a couple of minutes before we know we?re watching a show; the star is introduced a couple of minutes after that, and only as a member of the chorus; and we?re fully 10 minutes into the movie before we start to get a few threads that can be woven into a premise. ?Brazil? ends and immediately another number, ?You Discover You?re in New York,? begins. Two other important characters are introduced: Phil Baker, a huge radio star who never quite came across in movies, is the club?s entertainment director, and Alice Faye, who is actually the star of the movie, here the last of a line of identically done-up showgirls (done up to look like Faye). And for those keeping score, another convention subverted: We expect the star to be introduced first, but in TGAH Carmen Miranda gets the first number, while Faye only gets a couple of lines. But she?s singing directly to the camera, and she gives us the sweetest little wink with her warm smile, an acknowledgment that we?re being kidded in the friendliest possible way. Alice Faye was pregnant with her second child when she made TGAH, her last star vehicle at Fox. 4) Berkeley is going to keep playing with conventions, subverting narrative expectations and movie syntax, throughout the movie. It?s not going to stop. When Alice Faye sings the romantic ballad, ?A Journey to a Star,? to male ingenue James Ellison on their late-night Staten Island Ferry ride, there?s a shot about ten seconds long where they both have their backs to the camera. I can?t think of another movie where the romantic leads turn their backs to us mid-song. Only a director with authority and nerve would mess with us like that. It?s actually a rather intimate moment because it?s private. Instead of the song being performed for us, Faye is singing just to him, and they are in their own special moment, which we witness, but from outside (behind). Then even *that* is turned on its ear when Faye finishes singing and we hear applause and see that the other passengers have been listening as if they?re watching a show. So while the song was presented to us as an intimate moment between the lovers, even that was actually an performance.? ? Everybody dance: Benny Goodman and his orchestra provide the musical backdrop for a lot of the movie.? Jitterbugging at the USO Canteen to the live strains of the Benny Goodman Orchestra, one of several actual dance routines in TGAH. All actual dance routines were choreographed by Berkeley?s assistants?he didn?t choreograph a step, preferring to concentrate on his grand visions.? ?? ? ? ? ? ? The stage at the Club New Yorker, where (wink) mammoth spectacles are staged. Ships and water appear and disappear. The Club New Yorker?s stage seems to expand and contract from scene to scene and shot to shot. ? 5) Benny Goodman! ?The Gang?s All Here?is one of the backstagiest of backstage musicals, and it?s also a Big Band movie. Benny plays Benny (himself), and has no role in the narrative (such as it is), but the band plays a bunch of numbers throughout the film, staged in the most flattering way, and the Goodman sound sets and maintains the movie?s musical mood. It?s perfect. Berkeley introduces Goodman and Co. at the USO Canteen where Faye volunteers several nights a week, dancing with servicemen (entertainers in New York and Hollywood really did volunteer this way?an elderly student of mine had danced with a 17-year-old Shirley Temple at the Hollywood Canteen, how cool is that?). Once again Berkeley finds a very different way to shoot what would normally be shot as a conventional proscenium scene. He starts with a pretty woman getting coffee for a couple of sailors, then the camera moves past her into the standing crowd. As the camera continues to move forward through the crowd, people sit down in front of it so that the camera can continue on to the bandstand. We have a sense of how packed the joint is, and then we pan across the musicians, finally lighting on Goodman himself. He sings ?Minnie?s in the Money,? an ode to a Rosie-the-riveter type factory worker. ?She?s helping Uncle Sam to keep his people free / she?s OK, hooray, my Minnie?s in the dough-re-mi.? The band is fantastic, and we see several couples jitterbugging in the tight spaces within the crowd. 6) Eugene Pallette, Edward Everett Horton, Phil Baker, Carmen Miranda, Tony De Marco, and Charlotte Greenwood: A full house of veterans with legit theater, vaudeville and radio backgrounds are Berkeley?s utility players. Pallette and Horton are the stockbroker partners, physically, vocally, and temperamentally a study in contrasts. Tony De Marco was a star of the exhibition ballroom dance scene. Charlotte Greenwood had been dancing in theater since 1907, and her trademark eccentric dance moves are lots of fun. Two years after TGAH, Rodgers and Hammerstein wrote the character of Aunt Ellen in Oklahoma! with Greenwood in mind. Film commitments prevented her from playing the role on Broadway, but in 1955 she did finally get to play Aunt Ellen in the movie, and it?s perhaps her best-remembered performance. Eugene Pallette are a perfect comic match, while James Ellison gets the thankless male ingenue role. 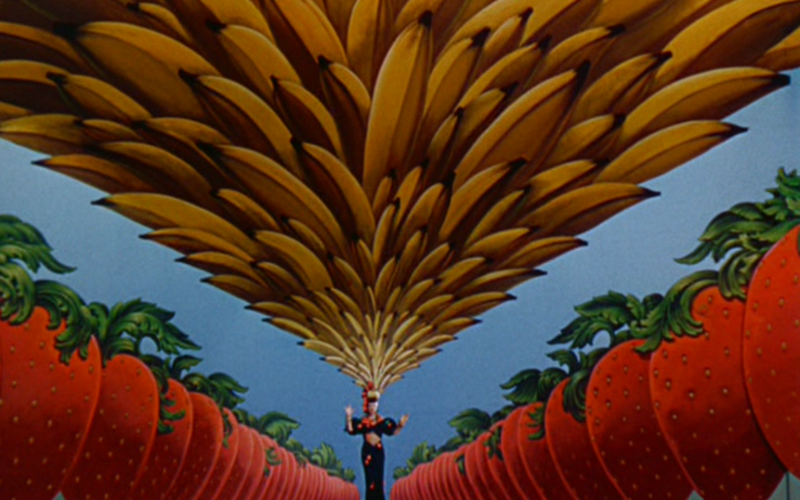 Charlotte Greenwood is as much a cartoon character as Carmen Miranda. It?s amazing that a single movie could support two such eccentric woman. But they are, like Pallette and Horton, such perfectly suited comic contrast, that it works. Greenwood, like Miranda, is an original. She?s very tall and large-boned, long-faced, and she has very long legs that she raises high in her trademark dance move. She gets one little specialty dance number, with one of her daughter?s friends, a goofy young jitterbugger. He asks her to dance, the perfect society matron in a long gown, and she is thrilled. When the kid busts a move she looks serious and says, ?He wants to play.? She?s not scared, she?s ready to go. Greenwood is such a wonderful actress that we can feel her exhilaration at getting to dance again, for the first time in years. 7) ?The Lady in the Tutti Frutti Hat? is?the?showstopper in TGAH, and it?s only 20-something minutes into the movie! There is absolutely no way to top it; it?s one of the most audacious, brilliant, bizarre numbers in Hollywood musicals. This sequence is the ultimate test of how well you use your mantra. It?s supposed to be a floor show at the Club New Yorker, and it begins with an organ grinder and his monkey (I wonder if the monkey was?on staff at the club? ?oops, the hell with realism). Then after a transitional shot in which the camera zooms into the fake greenery on a palm tree, it zooms out to reveal a set of small islands covered by picturesquely reclining showgirls, all clad a la Daisie Mae, artfully arranged, napping?in the sun. They get up and form a line, waving at an approaching mule-drawn wagon. Which turns out to be carrying a huge pile of bananas, and, of course, Carmen Miranda. ?Some people say I dress too gay / But every day I feel so gay / and when I?m gay I dress that way / Is something wrong with that? ?No!? Costume designer Yvonne Wood decided to declutter the fruit motif and cut it down to strawberries and bananas, and that?s why the number looks like it does. In addition to Carmen?s banana headdress there are the bananas in the wagon, which are transformed into a banana xylophone that Carmen plays a solo on. There are giant strawberries the girls use as beach balls. And then there are the giant bananas.? ? ? ? ?? ?? ? ?? Ah, the giant bananas. A big line of chorus girls waving six-foot-long bananas. Holding them over their heads to form an arch, creating a slow-motion wave? Really not much need to deconstruct this. And remember, as Freud once said, ?Sometimes a giant banana is just a giant banana.?? ? ?? The final image in this number is so extraordinary that it will burn itself into your brain; it is unforgettable. It?s stunning as a still, but you really have to see it as Berkeley?s camera does. It?s sort of the reverse of Miranda?s introduction shot, under the huge net bursting with fruit. There we ended on her close-up. Here we start with the close-up and pan back further and further, until she is a small figure at the back of the frame, and above her head is a fruit headdress that rises into the cosmos. Exhilarating and indelible.? After a few seconds of the full image, Berkeley brings us back into real space by showing the curtain dropping on the stage of the Club New Yorker. Throughout the film, Berkeley shifts from real space to dream space and back again, until the finale, which ends in dream space, not in this world. 8) The lull. Often Berkeley musicals group the showstoppers at the end of the film, and TGAH does so but also front-loads spectacular numbers (including the showstopper above) starting with the movie?s first shot. In the next 20 or so minutes we see the first club number (?Brazil?/?You Discover You?re in New York? ), a rather brief dance-lesson number in which Carmen Miranda messes with the prudish Horton and Ellison first spots Faye, and the USO Canteen scene. Then things slow way down and get a lot more intimate. There will be a few more numbers but no showstoppers until the show-within-a-show finale. You might feel a little bored, waiting for the next thrill. The plot is about as minimal as one can be and still form a scaffolding to hang all these numbers on, and some of the dialogue plays badly now?Ellison, who is actually a half-decent actor, has a lot of dreadful ?Gosh, gee whiz,? hail-fellow-well-met ?40s dialogue that?s painfully dated. Don?t let it get to you. Berkeley just isn?t interested in narrative. But he knows that you can?t go from one showstopper to another. That?s the thing about musicals: There?s a tension between narrative and spectacle. Berkeley totally dazzles us with the first 20 minutes, then gives us time to recover. He sprinkles comedy and musical/dancing scenes throughout the rest of the movie leading up to the finale, but he wants the audience ready to be dazzled again. It?s the same thing with prose, fiction or nonfiction?you have to understand pacing. You can?t establish a high pitch of suspense or gorgeous set pieces and just go from one to the next. The audience or reader has to have time to process what?s just happened and return to some baseline of calm so they can get excited at the next big moment. Berkeley?s tenuous connection to reality collapses entirely in the finale, breaking down into a meditation on that most basic geometric form, the circle. Here?s one: Tony de Marco is dancing on it. I love the saturated color in this shot. Which, in this case, is the finale. And this is where Berkeley finally ventures so far into dream space that this time he doesn?t bring us back. I?m not going to give the whole thing away except to say that Berkeley ends as we began, but instead of one disembodied head we get a whole bunch of them, floating on a field of blue, singing ?A Journey to a Star.? I hope you enjoy?The Gang?s All Here?it?s more than 70 years old, and there?s nothing dated about its intense strangeness, beauty, and silliness. And so we bade a fond farewell to the spooky, Technicolor inside of Busby Berkeley?s head. Thanks, Buzz, it?s been grand! This post was written for the?Backstage Blogathon, hosted by Fritzi at?Movies Silently?and Janet at?Sister Celluloid. Go see the other amazing entries?lots of great stuff! I love this musical so much that I went and bought the DVD. I love the characters, the costumes, the songs, the cinematography, just everything. Wish that I were around then. Seems to me that the 40’s was one of the best decades ever! I’m crazy about this one, too, and also have the soundtrack. The Gang’s All Here is unique; there just isn’t anything like it.